This book review, slated on the last Saturday of St. Valentine's month, was supposed to be about married love. It was supposed to open with a story about my grandparent's 60 + years of marriage and the question, what makes love last? 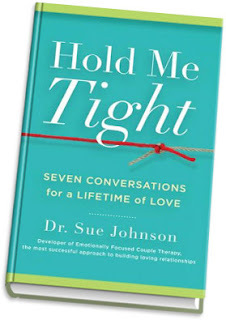 With over 40% of marriages, and yes, even Christian marriages, starting with "'til death do us part" and ending in divorce, I was going to review a secular marriage book, Hold Me Tight, Seven Conversations for a Lifetime of Love by Dr. Sue Johnson. You see, years ago, when my husband and I were leading a home group made up of several crumbling marriages, we came across Dr. Johnson's "Emotionally Focused Therapy." As a family doctor always in need of better therapy tools, my husband was intrigued with EFTs successes relative to behviorial or cognitive therapies. We considered travelling to Ottawa to participate in intensive EFT training so we would be better equipped to minister in our church, and, for my husband, for him to be more effective in his medical practice. While traditional marriage therapy boasts an almost negligible (like, close to 0% long-term) success rate for saving marriages at the brink of dissolution, Dr. Johnson claims 70-75% of couples who enter EFT couselling in crisis stay married through good times and bad. This is a similar statistic to Christian marriage therapist Willard Harley, author of His Needs, Her Needs: Building an Affair Proof Marriage. And while one author writes from an evolutionary/biological framework and the other from a Christ-centered framework, they both understand humans from the perspective of emotional need and attachment. And then I would tell you a little more about both books and that they are worthwhile resources for anyone who is married, ever thinking about marrying, formerley married, related to anyone who is married, or in ministry with or to anyone married. But I interrupt this book review because there is a completely different story I'd like to tell. I want to share with you a heartbreaking tale and a miracle to shed hope on tragedy. In the past few years we've experienced some of the most incredible faith-building, grace-filled moments of our lives and we KNOW God. But over those same years we've also shared in the pain of close family who have emerged from brutal, faith-destroying church-based abuse. These days it is hard to become carried away by religious hype. I add this preface to the story I am about to tell because I want you to know I am coming more from a place of caution than a from wide-eyed faith. We recently hired a housekeeper. A Lebanese woman with a firm handshake, a desire to work hard for us, and a penchant to share Arabic coffee with me (yum!). I'll call her Mariam. Mariam promised one morning over coffee that she would make me Tabouli, but the next week she apologized that she hadn't brought me this signature Lebanese dish. You see, her young cousin, a woman as sweet as an angel, Mariam says, was walking through a parking lot with her two young children, the baby in her arms and the toddler walking by her side. A car racing through the lot struck her three-year old daughter. The little girl, also named Mariam, was thrown twenty or twenty-five feet. A bystander helped the young mother load the child in a car and they raced to the Children's Hospital. Another bystander followed the car--it fled the scene--and managed to take down the license number. From what I understood from Mariam's broken English and hand gestures, Little Mariam's c-spine, the vertebrae in the neck, were broken and there was some swelling in the brain. I promised to pray for the little girl, and I did. That night at supper my family prayed for her recovery and over the next few days I continued to pray for her but in a way I can only describe as perfunctorily. Not that my concern was lacking, but my faith was. The next time Mariam came I asked after Little Mariam. This time as Mariam told me about the small child's condition (From what I could understand, she continues in a medically-induced coma and is in restraints to allow the neck to heal. The bleed on the brain is healing on its own without surgery, but the long-term damage is still unknown), I started to pray, "What can we do, Lord. In the face of such a tragedy? How can we show your love? Help." As Mariam described the way she was helping the young mother every day I started to understand that Mariam and her son were the woman's only family in our city. So I asked, where is her husband? Mariam told me he was in Afghanistan. The young mother had sponsored his immigration just three months ago. We discussed the difficulties with immigration and the long waits. I sponsored my husband's immigration. It took almost a year. My sister-in-law waited almost two. Recently we looked into sponsoring another family member. The wait can be as long as 48 months. I realized I wasn't encouraging Mariam. In Canada, once an immigration application is in process it is almost impossible to check on its status or to speed things along. It is also not possible for a potential immigrant to visit the country while the application is in process. Mariam knew this. So did I. And then I thought, we could look into a political solution. We could contact the young mother's MP or even appeal to the Minister of Immigration. This young mother needed her husband. I brought up the possible ways the family could bypass the bureaucracy to bring this father to Canada. Mariam brightened. She had an idea. The young mother had worked with an interpreter to process the sponsorship documentation. Mariam would suggest the young mother contact the immigration interpreter to help her find her apply for her husband to come to Canada as soon as possible. If that failed, I would work with the family to petition for compassionate leave for him to come to Canada. As soon as we finished talking, I emailed my fellow Inkies. Pray, I asked, explaining the situation. Pray for the child's recovery. Pray for this family. Pray for a way for the husband to come to Canada as soon as possible. And the wonderful Inky ladies prayed. And I prayed, too, through the morning. Three days later, Mariam arrived at my home bursting with news. Shortly after she left my house the cousin called Mariam's cell phone. She urged Mariam to hurry to the hospital. Anxious for Little Mariam, Mariam rushed to Little Mariam's room to find her cousin with the immigraiton interpreter! Mariam couldn't believe it. She hadn't mentioned our discussion yet, although she had planned to as soon as she arrived at the hospital. And so this is what happened: A few hours after my discussion with Mariam and my email to the Inkies, the interpreter went to the hospital to vist another child. When she saw the young mother in the corridor she recognized her from the immigration office. She asked, "What are you doing at the Children's Hospital? Are you visiting someone here?" The young mother told her about her daughter's accident, and that the child had been in a coma for ten days. The interpreter urged her to go to the immigration office without delay. Thus, the panicked call to Mariam. While Mariam sat with Little Mariam, the young mother and the intrepeter spoke to the immigration office manager. He called the Afghani Embassy in Ottawa and the Canadian Embassy in Afghanistan. A Canadian Embassy representative was dispatched to the father's village about two hours from Kabul (I presume). The young mother managed a call to her husband to let him know the Canadian officials would expedite his arrival in Canada. Within hours, all was arranged. He arrives in Canada next week. A coincidence? Or a miracle? Mariam praised God. She said, "So many prayers have gone to God's ears for Little Mariam. But we didn't even think her father could come to Canada. We never imagined it could be done until you said it might be possible. And then, we didn't have to do one thing. Not one thing. And it is arranged. Like that." "Praise God," I said. And then I added, "Do you know what a blog is?" She shook her head, no. "It is a thing on the internet, like a diary. I belong to a group of fifteen or so Christian writers. We write something on the internet every day, we take turns. And we are all Christian writers who write stories for Christians." She nodded, slightly puzzled now. "After I talked to you, I emailed all my Christian writer friends, and we all prayed for Little Mariam and prayed that her father could come to Canada." And gruff Mariam's eyes filled with tears and she threw her arms around me. I hugged her back and cried with her. God is good. And his goodness doesn't depend on our faith or belief. I still don't understand the mystery of prayer. But I do know a miracle when I encounter one. Join me and the Inkies and my home group in continuing to pray for Little Mariam. That God would heal her body completely. That her father would arrive safely in Canada and would adjust to this strange new world at the same time the family continues to help their daughter recover from her injuries. And that God's grace would abound in this family. And thanks for letting me interrupt my book review to share this miracle. Wenda, I'm so glad you interrupted your regularly scheduled book review to share this story, and I'm so glad that in some small way, I was privileged to be a part of it. I burst into tears when I read how God had been faithful to our prayers. As many of you know, I have a special place in my heart for Muslim women. Even though I knew the story, it still made me cry! God is so good! Amazing Story. I like the part where she says, "We didn't have to do anything." When people open themselves up, they find a community of helpers. Amen. Mary, you are so right. I also learned that we need to set aside our own busy-ness to make time to listen to people and to be willing to share their burdens. And to pray. And Dina and D'Ann, it made all the difference to know when I put out the call to the Inkies to pray that they would! Wenda, some of our readers may want to know how little Mariam and her family do over the next months, so bring back a good report later on. I was really touched by Wenda's actions. Not just praying but willing to be the hands and feet to show a hands-on love of Christ for all his children. Of course prayer is so important, but giving up time is a huge impact to a non-believer. Wenda, thanks for the post. I will continue to pray for little Mariam and her family. Thank you for being an example of God's love in action, a do-er of His Word. I will also pray for your strength and love for this family in the weeks to come. Thanks for your support and your prayers. I'll keep you updated on Little Mariam's progress. Our home group is also willing to jump in and lend a hand where one is needed. Wenda, just like I did when I read this before, I got teary-eyed and chills are running up and down my spine. I'm still praying. Please keep us updated on the precious little girl's condition.